We review Gaia Project, a heavy euro game published by Z-Man Games. 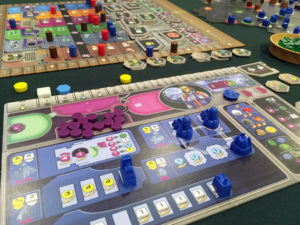 Gaia Project is a follow up to the wildly popular euro game Terra Mystica and we put it through the paces and see if it's a worthy successor. The first reactions to a second edition or a game derived from a much beloved title usually fall on the polar opposites of the excitement spectrum. This reaction chart ranges on one end from “eyeroll meh” to “Ermahgerd! Shut up and take my money!” And so, depending on a reviewer’s relationship with the first title, the playtesting for a review becomes an extension of work or a romp through candyland (if Candyland were an awesome game). And in exactly this manner, Gaia Project has arrived. It’s the futuristic, space colonization younger brother of Terra Mystica. The game is designed by the same team of Jens Drogemuller and Helge Ostertag with engaging art by the same Dennis Lohausen. Is it possible that this version is a dramatic improvement over the near-classic title that came before it? 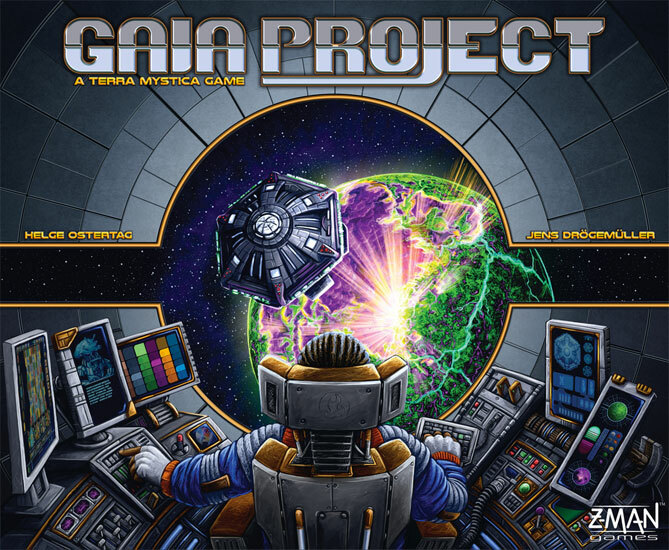 With a playtime of 150 minutes for 4 players and closer to 60 for 2 experienced players, so far Gaia Project seems to be in just the same ballpark. The 1-4 player range for Gaia Project is a slight downscale from the 2-5 for Terra Mystica. Gaia Project plays best with 3-4 players but even the solo and 2 player experiences are good. If readers are already familiar with Terra Mystica, almost everything works exactly the same with a couple of name changes and some different concepts thrown in. The rules overview below will use the new terminology and cover how it works overall for readers unfamiliar with the game. The big research and tech board shows the advances players have taken as well as technology tiles available. The main goal of Gaia Project is to acquire the most victory points. All of the sources focus on activities involving the colonization and development of structures on planets…in space. The map represents a variety of planets whose climate and atmospheres are divided into 8 types. Depending on how close a planet’s type is to the species a player has selected, they’ll need to make the newly colonized planet habitable. At the end of the game, additional end-game goals award points as well as any advances on one of six Research tracks. 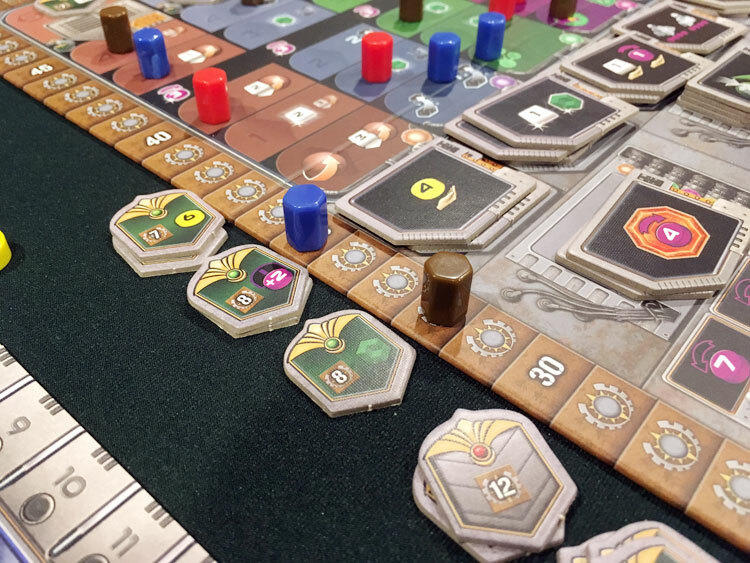 Over the course of each round (6 in total), players will gain an income of resources from their structures in the form of Ore, Credits, and Knowledge, take actions, and eventually pass once they’re done for the round. When taking actions, Ore and Credits are used to build new structures and Knowledge is used to gain Research advances. Additional actions available allow players to link planets to form Federations, which then award further victory points and resources. Player boards are just as elaborate as Terra Mystica with huge similarities. Reference information is on the right while structures and their income is on the left. Power bowls and a resource tracker are above. Buildings on planets follow a particular development path. Any time a player wishes to colonize a new planet, they will build a Mine. The Mine has a nominal cost in Credits and Ore. In addition, depending on how different the planet is from the race’s ideal world, they’ll pay additional Ore to make it habitable. This extended cost drives much of the limitations in the game as players need to carefully pick the planets to colonize. Once on a planet, a player can further develop the Mine into a Trading Station, and eventually into more powerful structures, each of which provide their own specific bonuses. A fourth resource available to players is Power. Any time a player builds or upgrades a building near another player, the other player can receive Power at a small cost of victory points. This is a major resource management aspect of the game as building and upgrading near other players in just the right way maximizes the Power received while minimizing giving Power. Finally, in addition to all the above, every player’s Faction (species) Board grants some unique abilities. These are major rule-breaking changes that allow a race to gain an advantage in some situations and make them more limited in others. Gaia Project’s main conceit of gaming fun comes from exploring each race’s abilities. Overall, it’s extremely difficult to encapsulate the play of Gaia Project in a short description of the rules. Readers are strongly encouraged to see the rules for themselves. As structures sprawl across the board, the game’s point race accelerates. 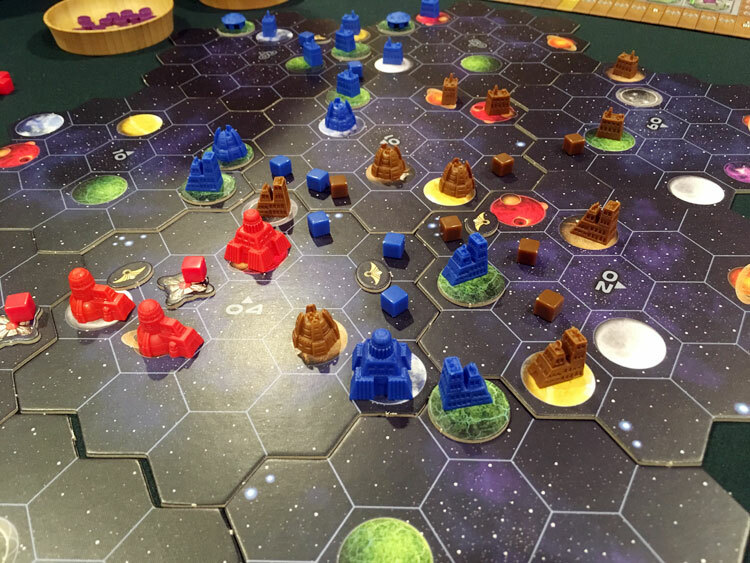 Readers might be interested to know that this reviewer found the original Terra Mystica to be less than stellar (pun intended). It was a good game, but overly long, especially with 5 players, lower player interaction, and a fixed board layout that became stale quickly. However, this title has changed impressions of the game 180 degrees. For each round, a certain goal is scored while markers track end game goals. Many complained of Terra Mystica’s thin theme. As a science fiction, space exploration and colonization game, Gaia Project works exceptionally well with the theme. It’s believable and approachable in a way that didn’t make as much sense with fantasy races (changing a patch of land into mountains or swamp?). The excitement over seeing a faction’s special power comes with an understanding that science fiction stories work well when talking about global, planetary changes. This also means that there’s more to enjoy in terms of racial powers, with options that would have stretched the theme pretty far before. But besides the theme, Gaia Project brings deep, deep strategy and challenge with every play. The races have idiosyncrasies that reveal themselves with different player counts and types of players. It remains true that playing to a races’ strengths will generally yield more points than not, but the powers of the different races are also more situational, keeping disadvantaged board setups and race choices still viable for good play. By forming a federation (grouping of structures), players can earn tiles granting more points and/or more resources. Another aspect of play is the engrossing challenge of finding the right source of points from round to round. If anything, Gaia Project is about planning ahead for future costs and abilities needed. Players who “wing it” from round to round will not be successful. Here, experience matters and players with more playtime than others are certainly rewarded. Also appreciated is the inclusion of plastic miniature buildings. This may seem like fluff for some gamers, but for the theme immersion, this was a crucial addition. This also opens more exciting visual options for expansions to player boards and structures in the future. In reality, every game has some negatives, but at every moment to analyze those for Gaia Project, the same thought was “It’s just not that big a deal.” The biggest complaint could still be one of no direct player interaction, but that’s expected for this title and not really anything that was truly missing. 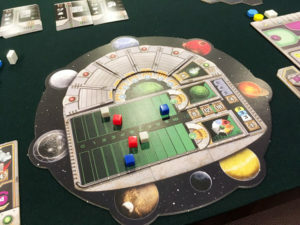 The options for competing with players for end game goals and the limited resources of some technologies will drive just enough competition in the game without any “space battles” to complicate matters. Gaia Project represents a perfection of Terra Mystica. 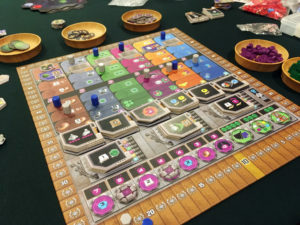 If gamers soured on Terra Mystica for its fixed board and steep learning curve, the rules have been simplified and streamlined, while still retaining a heavy strategy experience. There is a huge amount to explore and challenge gamers with every play, a testament to the high quality of the original design. 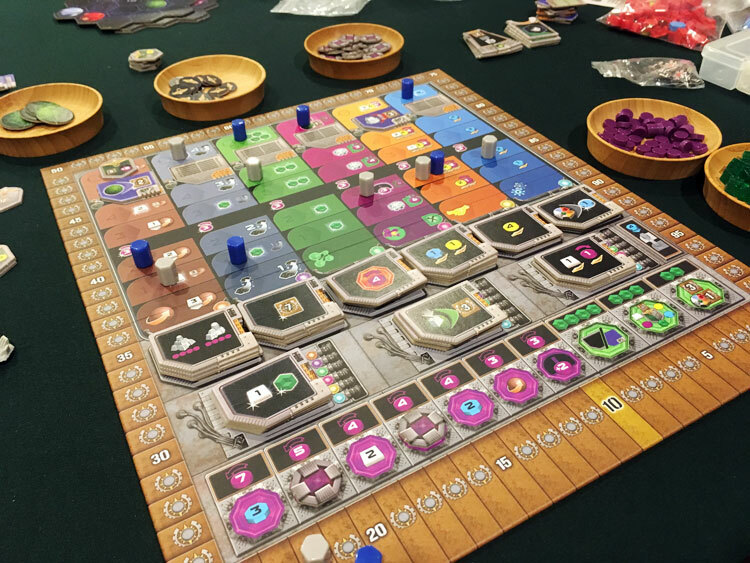 Terra Mystica lovers might be less excited, but holdouts for the best iteration of the game will be overjoyed with Gaia Project. 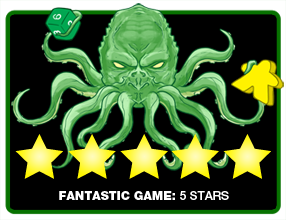 Final Score: 5 Stars – The pedigree of Terra Mystica is enhanced and heightened with Gaia Project. It is a sublime perfection of an already great game.